This year’s Camp Connect is scheduled for Wednesday through Friday, June 8th through 10th, at Windermere Baptist Conference Center. The camp is for boys & girls grades 4 through 6. 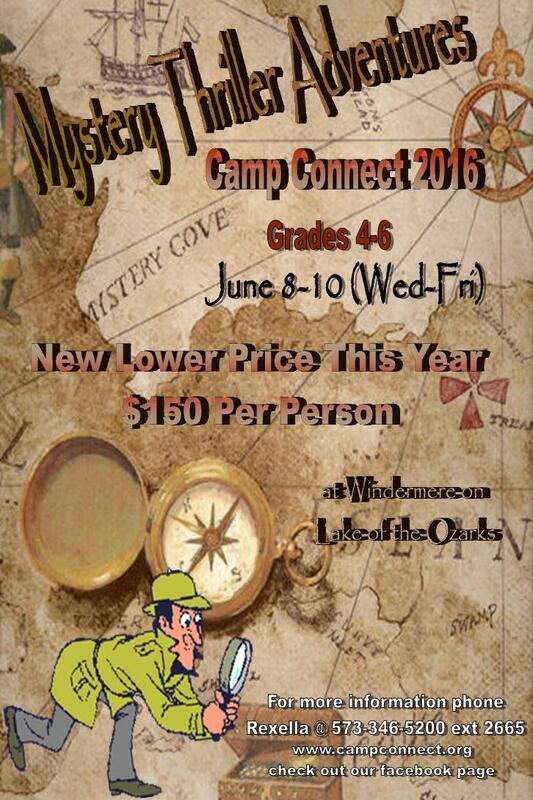 The theme for this year’s camp is Mystery Thriller Adventures. This year’s camp features a new lower cost of just $150 per person. It is time to get you reservations now! Check-out the event website at www.campconnect.org. Call or email Rexella Bennett, Guest Relations Coordinator, for more information at rbennett@windermereusa.org or 573-346-5200 extension 2665.